The deal was sealed. Aidan Byrne was poorly, and Simon Wood stepped in to take his place at the Bolton Food and Drink Festival 'Sunday Club' event. I have much love for Aiden, but was thrilled to find out Simon would be joining the ever entertaining Andrew Nutter for some Sunday evening tomfoolery. And there it began. 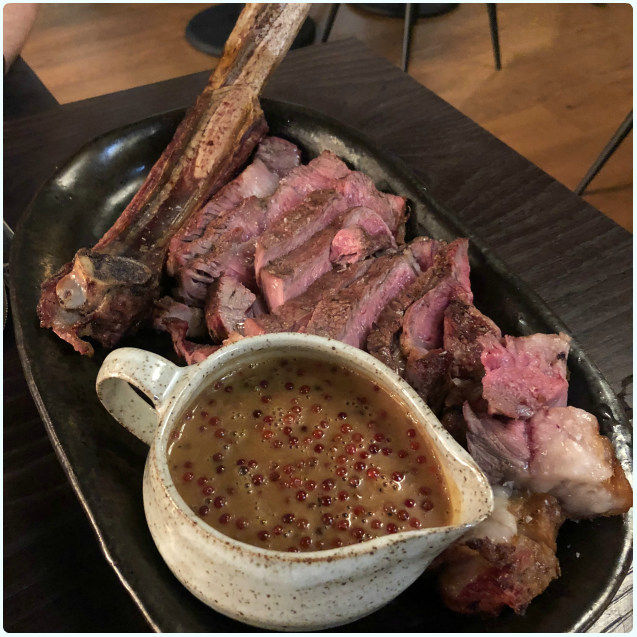 Turns out we became his biggest fans in the blink of an eye, and ended up devouring a Tomahawk at Wood two days later. 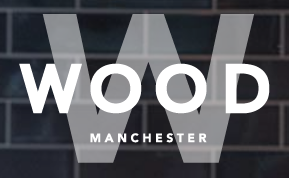 Wood opened on Manchester's First Street site a sniff over a year ago, but I'm convinced that folk are not fully aware of its brilliance just yet, probably owing to the location. However, fellow new kids on the block Bunny Jackson's and School for Scandal are changing everything. I'm hoping that it's going to become a bit of an alternative playground for those who love a bit of decent music and good food. 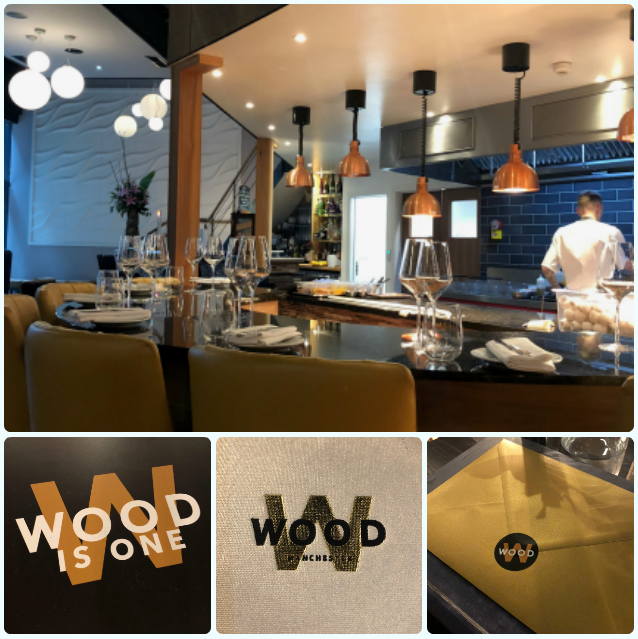 Simon won Masterchef in 2015, opened Wood in August 2017, and bagged themselves an AA Rosette within a year. Then came plans for a second site in Chester's Indigo Hotel, and now Woodkraft is about to open in Cheltenham. Not bad really. There's no doubt that he's an extremely accomplished chef, but he's also a bloody nice fella too. And he likes metal. We like him. He's not alone in this venture though. 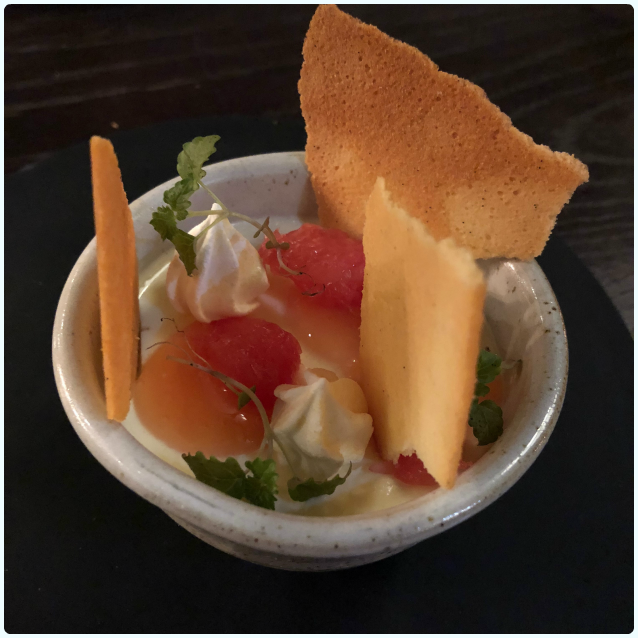 He managed to snaffle Mike Jennings as Head Chef, and has an excellent front of house team who make the experience even more pleasurable. I first met Mike when he was at Grenache, producing food that gave Salford a right kick up the backside. He's great. The styling of Wood is just beautiful, with nothing out of place and every item carefully considered. The kitchen is partially open, which allows nosy people like me to watch the chefs prepping those huge tomahawks. Makes you really hungry though. I suppose that's what starters are for! 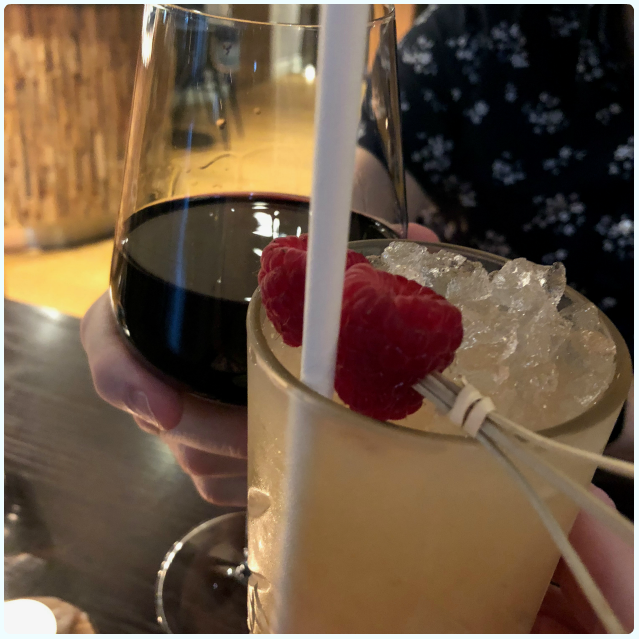 I was on the antibiotics of doom at this point, so was sans alcohol, but our waitress (who clearly saw my anguish) quickly produced a mocktails list, and all was well. Phil opted for a nice glass of red, whilst we perused the menu, listening to The Pretty Reckless and Pvris. If you know, you know. 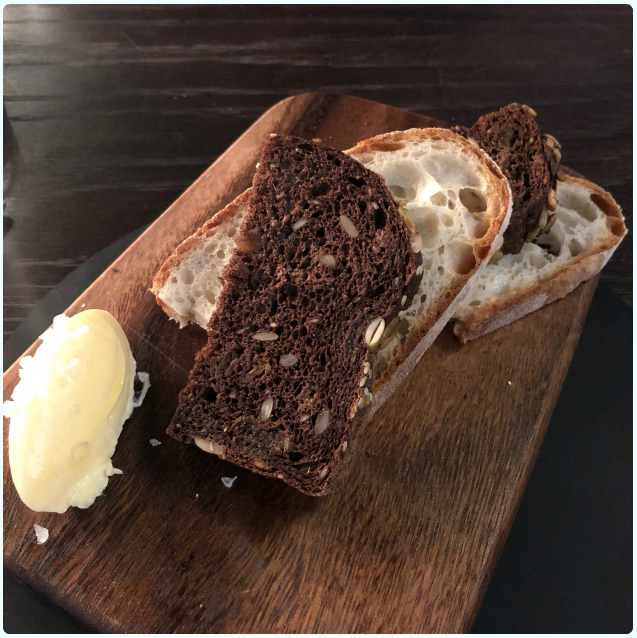 The scent of steak being very much real, we were thrilled at the arrival of some freshly baked bread and salted butter. Always start a decent meal with some interesting carbs. 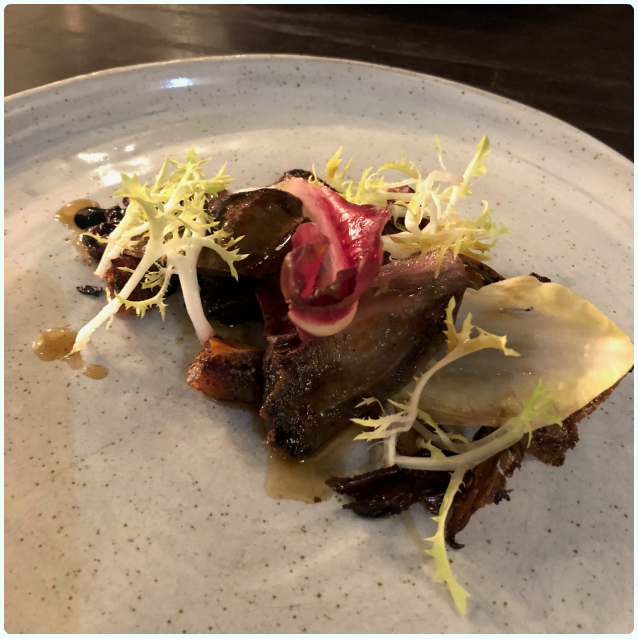 Pigeon, fig, endive and belazu lardon: One of the best starters I have had in a long time. Crispy edges on that rich pigeon breast with the sweet fig neared levels of actual perfection. 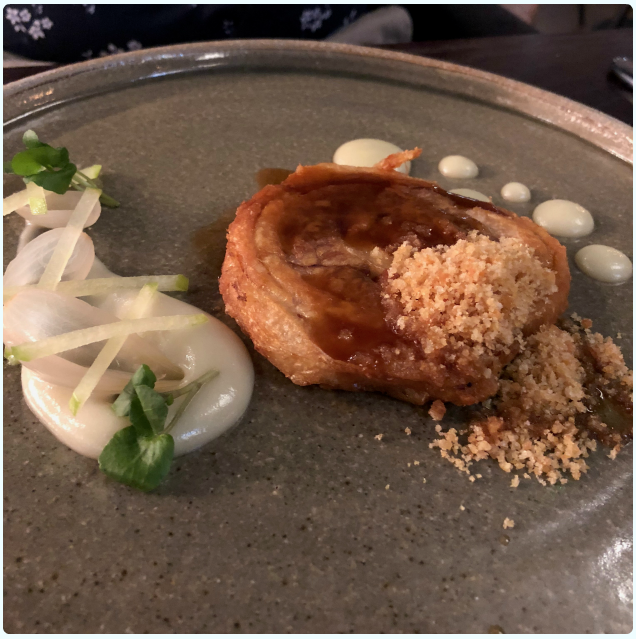 82°C belly pork, cider, Granny Smith, sage and onion: This was mentioned during Sunday Club, and had to be ordered. Phil's a massive fan of pork and crackling, so this was right up his street. Pared with tart Granny Smith apples, this is the culinary equivalent of a hug and a kiss. 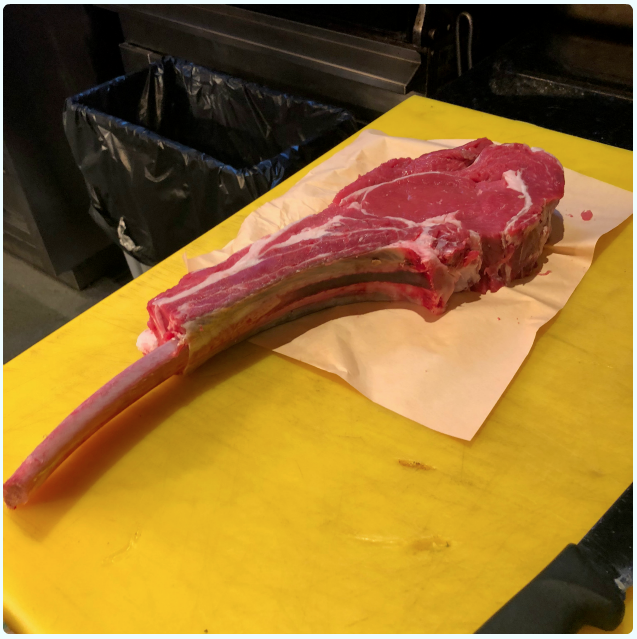 Tomahawk to share with green peppercorn sauce: The scale of it man. 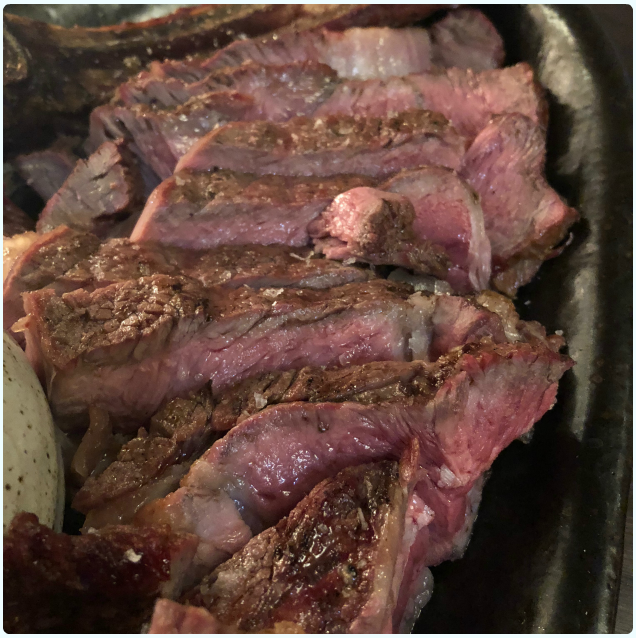 This bone in rib of beef makes me feel like a cave dwelling carnivore who will never be short of iron again. Granted, it is for two people, but it's still a fair 'un. Cooked to near witchcraft perfection, with a fragrant peppercorn sauce. Behold. I'm not saying anything else, because I've lost your attention to the pictures. Baby jackets and broccoli with black onion seeds: Simplicity at its best. 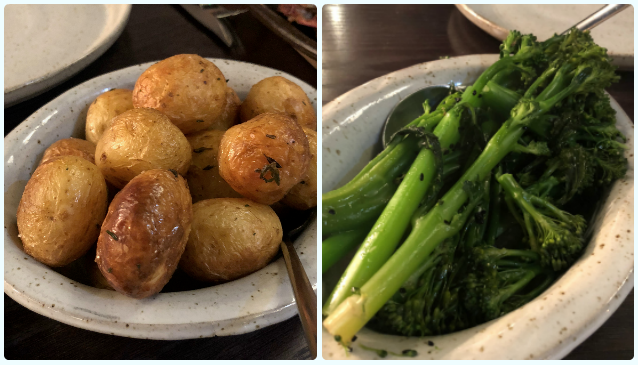 Soft potatoes with crispy, salty jackets, and crisp broccoli with sweet onion seeds. Citrus tutti frutti: Lemon, lime, grapefruit and orange heaven. I always opt for berries rather than citrus, but this was fresh, light and an absolute delight. At this point in the meal, I could not fault a single thing. 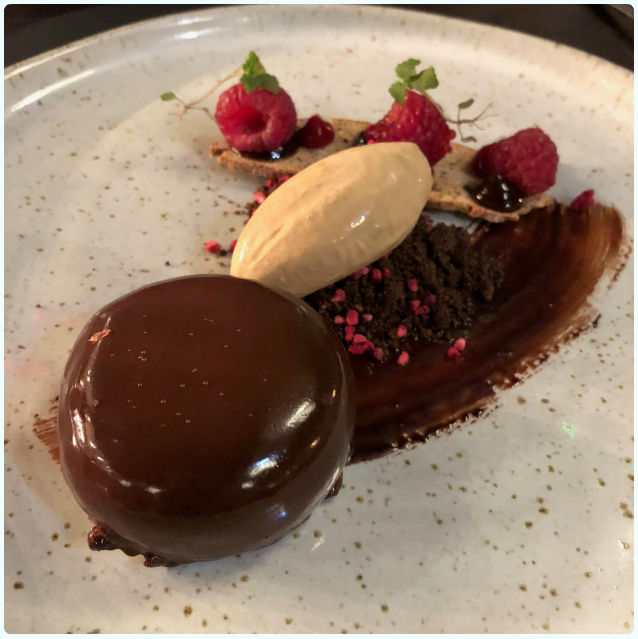 Chocolate, espresso and salted caramel: Surprisingly light as a feather, and not overpowered by the coffee. Tea: We needed the caffeine after all that food. 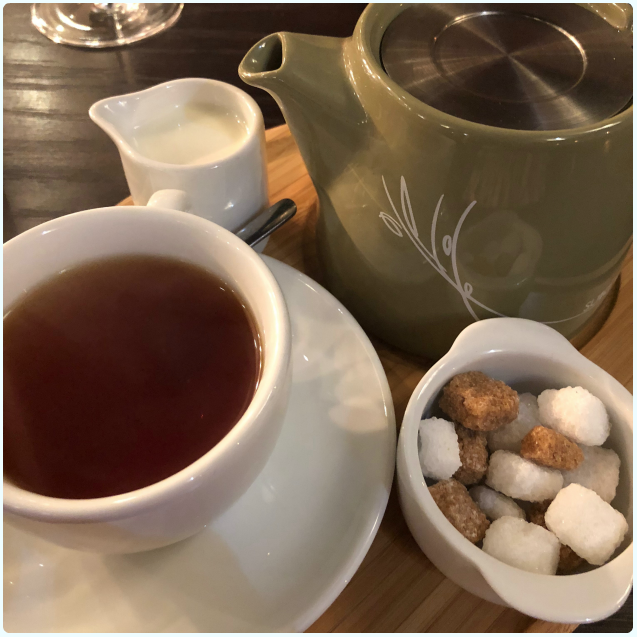 Even the tea pot was cute. 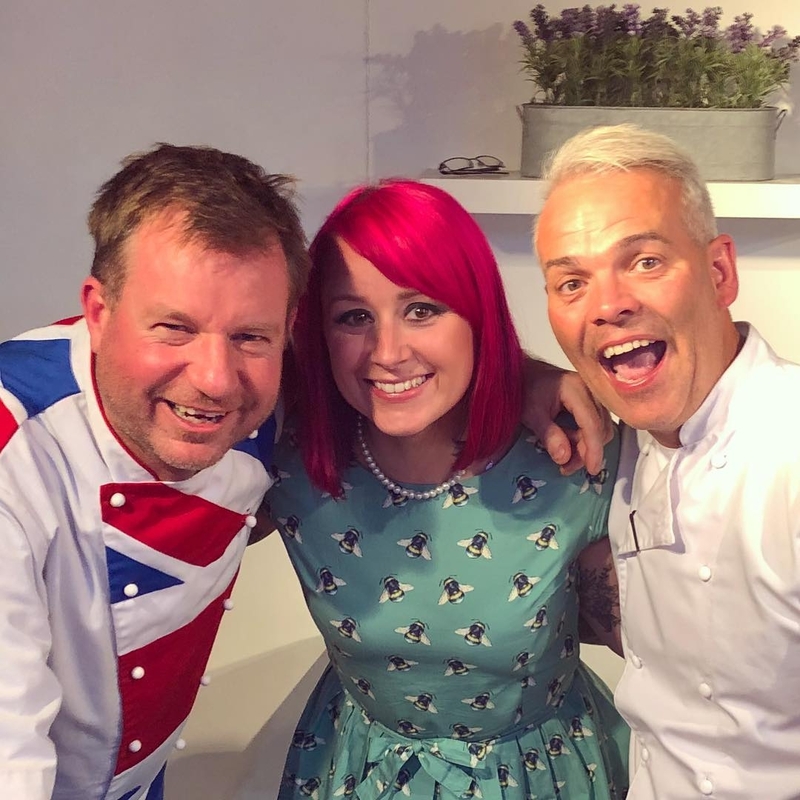 I will not have a bad word said about Simon, his team or his restaurants. I'll fight you. Admittedly, I just love eating out and trying new places. I will look for the positives over negatives every time, and always enter somewhere new expecting to love it. However, every so often I really fall in love. This is when outstanding food and service work in harmony, and I genuinely like the people running the show. Wood is firmly in this category. Go to Wood for delicious food, warm service and great music!